Welcome to the 774th TAS Association web site. For those of you assigned to CCK in Taiwan, there is a reunion scheduled to be held in Dayton, OH from July 9-12. You can read about it here in this article from the Stars and Stripes newspaper. Mystery solved? A dive crew claims to have found the C-130 that was "stolen by an airman" on May 23, 1969 from RAF Mildenhall. Read the story from the Stars and Stripes here. This picture of the 774th TAS building at Clark AB in the Philipines is courtesy of Mike Hensley. Got more sad news from Ben Fallin. Garry Fancher, a 774th pilot, passed away on 12 November. Very sad news to report. Jerry Sapp has passed away. He was a giant in the squadron leadership and will be sorely missed. May he rest in peace. Read the President's After-Action Report of the October 2018 reunion. If any one has good pictures from the reunion that they would like to share with others on the web site please send them to me at webmaster@774tas.net. Scott Murphy informed me that Scott Carr passed away about seven or eight years ago. He was an Air Reserve Technician in the 731st TAS at the time. Steve Tomhave wants us to know that Kevin McNeight passed away in March 2018. I saw this article in the Stars & Stripes online about the downing and rescue of a C-130 piloted by Don Jensen over An Loc, Vietnam in 1972. I'm sure many of you remember that day. Click here for the article. Received this from Doug Wolff in regards to Mike Lutzko: Sorry to hear about Mike. We crewed together on the '76 Mildenhall rotation, and flew with the RAF on the Long Link V exchange. 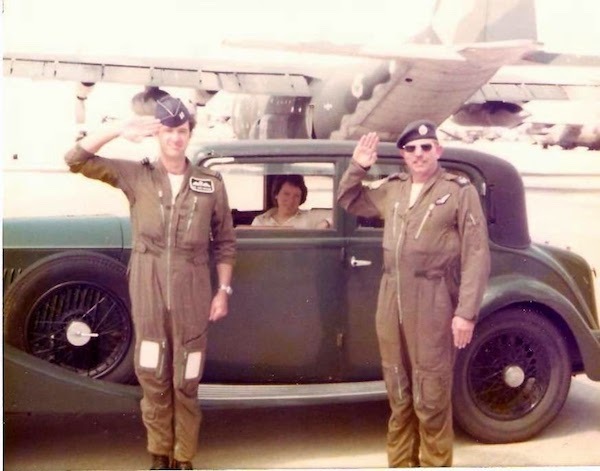 Here he is with A/C Bob Winter wearing purloined RAF flight gear, loitering with the LXX squadron commander's wife and classic Rolls. RIP, Mike. Got this sad news from Bob Carlson: Nick LaFlamboy passed away April 29, 2017. Nick was a bit of a Wild Man. I was with him in Africa when we landed on RWY 24 at Bamako and took the first taxiway 900 feet down the runway just to show the Germans (flying C-160's) we could. OK we may have touched down in the overrun but so were the Germans. For more info on Nick LaFlamboy click here. Pictured from left to right: Shelley Kelley and Nick LaFlamboy. I have no ID on the other two crew members. If you know please send me a note. Found this article in the Stars and Stripes about the very last active duty C-130H that left Yakota to be turned over to the Guard or reserve forces. It is an old Dyess H model. I received word from Bennie Lopez that Mike Lutzko passed away on May 9, 2017 from injuries he received in a motorcycle accident. The Biannual Reunion of the 774th TAS Association was held 16-17 September 2016 in beautiful San Antonio, TX. 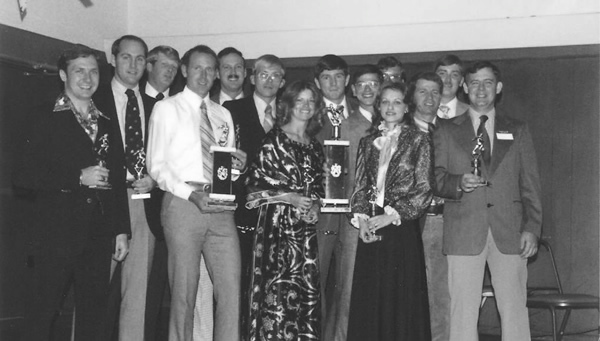 The Reunion celebrated the 30th anniversary of the squadron's closing in 1986. It was a great time and a well-organized event. Our gracious thanks to Van Hammack and his team that set up the events. More information and pictures will be posted soon. At the business meeting, Larry Farriss was elected President of the Association. The decision was made to hold the next reunion of the Association in Colorado Springs, CO on 5-6 October 2018. That weekend should coincide with the Navy vs. Air Force football game. A football game between the Service Academies is always a great time and of course there will be other events. Stay tuned to this site for updates. The best way for the Association to keep up with your whereabouts is through e-mail followed by a postal address. If you have moved in recent years or changed your e-mail provider please take a couple of minutes and complete the Survey Monkey form below. Thanks! 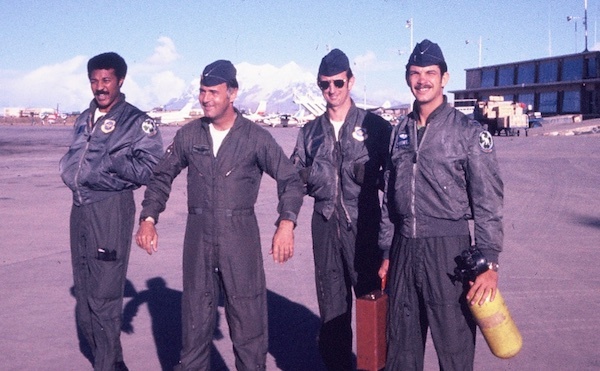 We have lost Richard Thompson, a loadmaster that came to Dyess from Forbes AFB when it closed in 1973. Was notified that Sonny Beach passed away on 3/11/15. Sonny had been a Flight Engineer. He was a member of the crew that had all engines shutdown over the Pacific at different times, they were able to air start two. Will post more info if I get it. The tentative time frame for the next reunion is September or October 2016 which will coincide with the 30th anniversary of the closing of the squadron at Dyess. Didn't make it to the reunion, but still want to contribute? You can donate to the Don Potter Scholarship Fund. You can use the reunion registration form to make a donation. Many thanks to those who have already contributed! Buzz Howard informed me that Bill "Buddha" Caldwell passed away recently. He wasn't a Green Weasel, but he was a Dyess legend.You	can read his obituary here. Just got word on the passing of two Green Weasels. Henry Hibbert passed away in October 2013. Billy Brewer died several years ago in Wichita Falls, TX. If anyone has a link to any information for Billy, please pass it on to me so I can post it here. Glenn Ellison informed us that Shelly Kelly (Loadmaster in the 774 and 772) passed away Friday night, January 24. His sickness was short and unexpected. His final arrangements are in the process but the funeral is set for Thursday, the 30th. Rememberances can be sent to Mrs. Jeanette Kelly. He was a good friend and will be missed dearly. Photo 1: Note the squadron patch 3rd person from left. Photo 2: Dyess bird going home. Slide show 1: Includes several photos of 774th EAS in action. Got this picture from Doug Wolff. It's the Dyess AFB Football Champs circa 1979/80. How many can you name? Check out the fancy attire. More sad news: Rocky Skillern passed away this week. He was with the 774th in the mid '70's to early '80's. He was a pilot with United Airlines for 26 years. 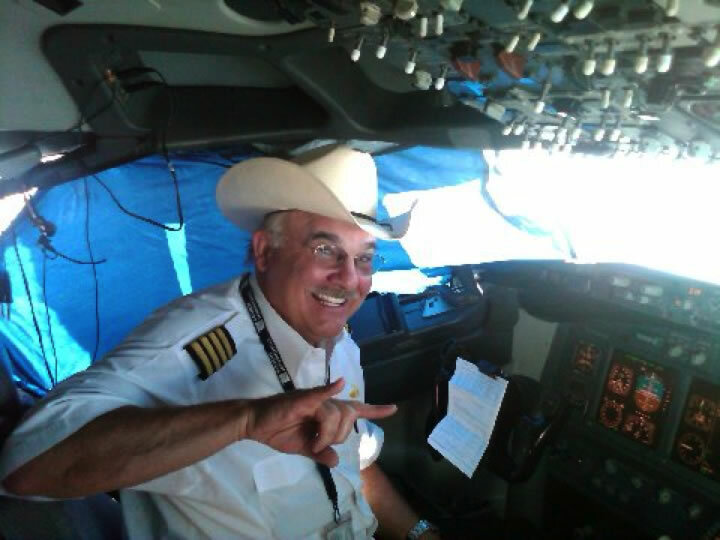 According to news sources, he was flying from Houston to Seattle when he had a heart attack. May God rest his soul. Received the following from Steve Tomhave about the passing of Pete Livingston. Pete Livingston was a professional in all respects. He served with distinction and honor not only in the military but as a civilian servant teaching students and as a Scoutmaster...always keying on integrity, service and mission. Pray for Sandy and the family. Just added new photos from the Woodapalooza, a get together to honor former Commander Col Floyd Wood. 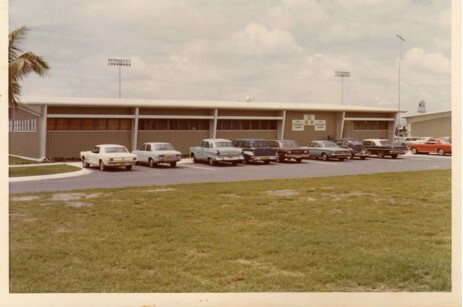 Robbie Robinson also added personal photos from the 70's and 80's taken around the squadron building. Find them in the Connect section of the web site. Al Armentrout passed away in 1991. He was in the original cadre assigned to the 774TAS from Forbes AFB, KA. Received word about the passing of Wayne Hanson. Wayne was a long time Flight Engineer in the 774th and was the Engineer on Ed Campbell's intergal crew for several years. He was a great guy and never tired of messing with Ed's head. Got the following update from Bob Carlson on the passing of Stan Friedi. Stan was in the 774th from fall 73 to about early 76 or maybe 77. He flew with Ted Heidemann in Africa in 1974. Click here for the obituary. For those of you who were also assigned to the 36th AS in Yakota, here's an article from Stars & Stripes about their annual Christmas Drop. Thanks to Robbie Robinson for this link to 2012 reunion pictures. 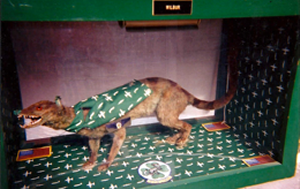 News from Stars & Stripes which mentions an ex Green Weasel, Lt Gen Frank Kisner. He is the Commander of NATO Special Operations Forces. The linked article describes the opening of their new headquarters. Click here for the story. There will be new information concerning the Don Potter Scholarship that will be posted soon. This is a great opportunity to earn $1000 to defray some college costs for an eligible person. Found two articles in the Stars & Stripes about airlift. One describes the workload of the strategic airlift crews from stateside to Afghanistan. To view this article, click here. The other describes C-130 airdrops in country. To read this article, click here. Kudos to former Green Weasel Mark Zamzow. Third Air Force vice commander, Maj. Gen. Mark R. Zamzow, assumed command Friday of U.S. Air Forces Africa from Maj. Gen. Margaret H. Woodward, who led 17th Air Force and U.S. Air Forces Africa since June 2010. See the whole story here. I do wish to send my continuing thanks to the organization for the award of the first Don Potter Scholarship. Jennifer Stowbridge will graduate May 12th from State University in San Marcus with a Bachelors of Science with a major in Chemistry. She is an honors student and will claim either Summa or Magma Com Laud ropes. The jury is still out on that. She got her start thanks to the Scholarship we gave her. Someone forwarded this You Tube video called Angel Flight. Found this Stars & Stripes article about the 109th Airlift Wing flying the LC-130 to the South Pole. Bob Mask sent a link for a You Tube video on the Four Horseman. It's a must see video of our ancestors in the 774th TCS. I also added a link in the Links section of the website for the 463rd TAW Association for those who may be interested in that. I found this story in the Stars & Stripes about C-130's using GPS for airdrops in combat zones. Larry Harris sent this link to a site that shows a C-130J flight demo at the 2011 Paris Air Show. Buzz Howard alerted me to an article in the December 6, 2011 Wall Street Journal, that talked about the cost of flying fuel to outposts in Afghanistan. The article specifically mentioned crews of the 774th EAS. The online article has some impressive video of these airdrops. Our scholarship committee has released the application form and the rules for the 2012 Don Potter Scholarship Program. Click on the scholarship link above for this information. Thanks to Robbie Robinson and Ray Powell for their work on getting this information out. Here's a link to a great article about how GPS is being used to improve accuracy in air drops. The missions refered to were being operated by crews assigned to the 772nd EAS. Also check out the related videos. These missions were operated by 774th EAS crews. It really is some spectacular footage. Question 1: What was your favorite place to routinely go TDY while you were assigned to the 774th? Over 60 percent of you answered Mildenhall. Frankfurt received two votes, while Pope AFB, Guam, Yakota, Hopkinsville, Keesler and Athens all received one vote. Two responders liked everywhere they went. Question 2: What was your favorite type of mission? Almost 40 percent answered trash haul as their favorite mission. Equipment airdrops and HALO (High Altitude Low Opening) each got 14 percent, followed by LAPES (Low Altitude Parachute Extraction System) got 3 votes or 11 percent. Personnel airdrops and CDS (Container Delivery System) each received 4 percent. Write in favorites included SOLL (Special Operation Low-Level), Dirt strip assault landings, low altiture and dark, and Eagle, which I must confess I don't know what that is. Question 3: What was your crew position? 11 pilots answered the survey, followed by 7 loadmasters, 6 navs and 4 flight engineers. Thanks to all who took the survey. I will try to have another survey up next month and I am open to any questions you might be interested in asking. If you have a question, send it to me at webmaster@774tas.net. For your information, I cannot tell who answered the questions. To update the Association's database of e-mail addresses, I will be sending out an e-mail to the address on file in our database of members. It would save me a bit of work if you could please send an e-mail to me, webmaster@774tas.net, with your current e-mail and postal address. If you don't get an e-mail, your address may be missing from the database. This is in preparation for next year's reunion so that we can maximize attendance. This will take some time because I am in the process of moving from Arizona to Georgia. I have been in contact recently with a few of you already, and I appreciate your cooperation. Dyess AFB celebrated the 50th anniversary of the C-130 at Dyess AFB in April. You can see some great pictures of C-130's at Dyess on the Wing's Facebook page. Want to join the Association or renew your membership? Click here. If you could not make it to the 2010 reunion, you missed a great time. The Association decided to hold it's next reunion the first weekend of October 2012. Put it on your calendar and plan to meet old friends and have a good time. Motions were passed to amend the bylaws of the Association that Association officers do not have to reside in the Abilene vicinity and that reunions do not have to be held in Abilene. New officers were elected. Congratulations to Jeff Anders, the Association's new president. Thanks to all who volunteered to serve in their posts. Robbie Robinson posted pictures of the 2010 reunion at his photo album web site. You can go to it by clicking HERE. The scholarships committee awarded the 2010 $1000 Don Potter Scholarship to Ashley Bartels, daughter of Mark and Liz Bartels. The $1000 was awarded by Judy Potter. Congratulations to Ashley and keep up the great work.